David and I have a list of countries we are going to visit, and Spain is on the list. 4 years ago we nearly went to Spain. We had wanted to go to the Indianapolis 500 (and yes, I do know that Indianapolis is in the US) but Dave said it was too far to travel. So, we decided to go to the Formula 1 race in Spain. A friend of ours was the chief mechanic for what was then BAR and we could have had a VIP experience. We looked at the cost of the ticket and decided to spend that money on B & B’s in Brittany. It was a good thing we did not go to Spain, as that year BAR were excluded from a race and the Spanish Grand Prix was the one they did not partake in. Our trip to Brittany was amazing, and it was that trip that made us decide to do self catering holidays from then on. I am not sure when we will get to Spain, but in the mean time I can experience the taste sensation by using Spanish ingredients in my cooking. This is the inspiration for the Pasta Spagnolo recipe. This dish looks so simple, I was surprised to see how long the list of ingredients it has– I can imagine that it has lots of subtle flavors and hidden veggies. Love it! What a lovely dish – thanks for participating in this week’s PPN! 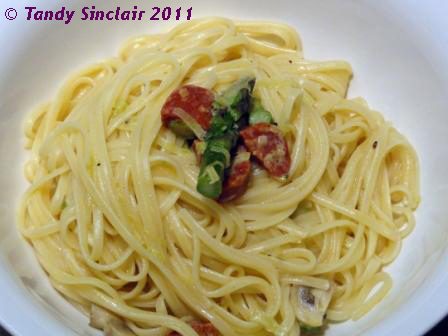 Yummy – love the asparagus chorizo combo. I like the look of this dish, wouldn’t have thought to pair asparagus and chorizo.